For HF measurements, a 50-100 MHZ scope will work very well. For two meter measurements a 200MHz scope is needed. We recommend portable scopes. They are simple and reliable and lower cost than bench top scopes. There are still some CRT scopes available new, but most manufacturers now produce only DSO (Digital Storage Oscilloscopes). While the CRT scopes are very easy to use, they do not provide for automatic measurements. However, they are well suited for many of the measurements ham radio operators need to make. Our recommendation is the The Hantek 200 MHz DSO 5202B. It was especially selected for its high bandwidth, ease of use and suitability for ham radio measurements. We provide this scope in our packaged measurement offerings. It is a rugged reliable performer with a great user interface at an affordable price. By packaging this scope, you can save considerable money over buying the scope separately. 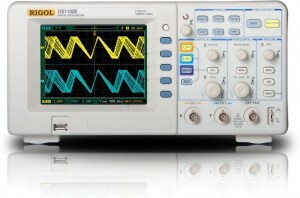 This scope was especially selected for its high bandwidth, ease of use and suitability for TDR measurements. It is a great scope to have in your shack. It is well suited for use with our station monitors, two tone test generators, samplers, couplers and return loss bridges. For those on a budget, older Tektronix scopes are available from on eBay. These scopes when new, costs thousands of dollars. They are very rugged and reliable. Most of these scopes do not use a microprocessor and all controls are generally switches hard wired. These scopes can be had for bargain prices from $75 – $200. There are a number of service centers found on the internet which will repair and calibrate these scopes. Great scope! Produced by the thousands from the late sixties to the mid seventies. Considered by many the standard of portable CRT type scopes. They feature main and delayed time bases, excellent triggering, and very flat vertical amplifiers. High bandwidth version of the 465. Produced from the late sixties to the mid seventies. Used in high end computer service and some R&D applications. Will work well in HF and 2 meter measurements. Low cost, light weight, reliable. Used in the computer service industry and education. Produced from the mid seventies to late eighties. Uses ICs and discrete components, includes automatic intensity and TV triggering. The high efficiency switching power supply reduces weight and power consumption, although it can cause some low level noise to nearby receivers. Most control switches in the vertical and time base range setting are of the cam switch design, they are rugged and long lasting. Great scopes! The are a higher bandwidth version 2213 and 2215 models. They provide a high writing rate making low rep rate signal at fast sweep speed easier to view. They are characterized by low distortion and very flat vertical amplifiers. Also includes TV trigger and delayed sweep B triggering. Some even have digital volts, time and frequency measurement capability (2236). Produced from mid seventies to late eighties. They were and are still used in the high end digital service industries and some light R&D. These were considered the new standard following the model 465. New scopes cost more. They provide very convenient automatic measurements. They are much lighter and thus more portable. Generally, sample rates should be greater than 1G samples. Many have FFT functions built in. This allows them to make frequency domain measurements and are handy as a poor man’s spectrum analyzer. They are available online and from the big electronic super stores. Both the Tektronix and the Rigol scopes are made in China. 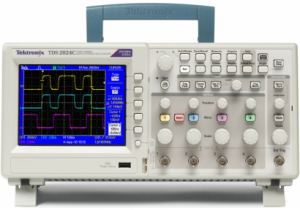 The Tektronix version of the TDS 2000 series provides a lifetime warranty and NIST (National Institute of Standards and Technology) calibration certification. They also feature self calibration using internal amplitude and time standards. If you don’t need the NIST certification and guaranteed accuracy of the Tektronix scopes, the Rigol scopes provide the best new price and a similar feature set as the Tektronix scopes. I use a Tek 2236 that I bought MANY years ago for $100. A decent analog ‘scope can still be found for as little as $1/MHz. I just watch my xmter envelope waveforem with a simple pickup. With triggered sweep and larger CRTs, any of these scopes are a much better choice than any of the more expensive ham scopes. It appears that many hams with amplifiers “fly blind” without any form of oscilloscope, and tune their amplifiers for maximum CW output power. That may partially explain why there are so many unnecessarily-wide SSB signals on the ham bands.